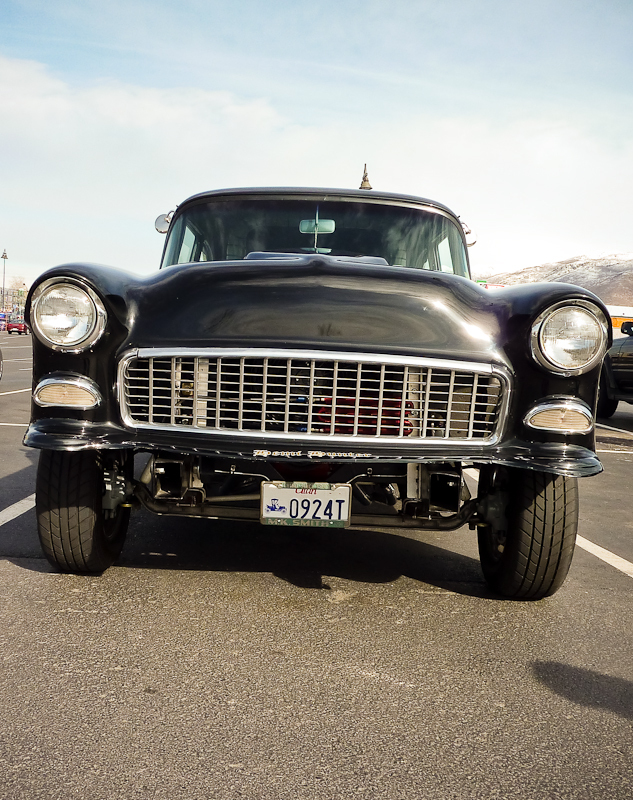 So, February in Utah isn’t a great time to bust out the street driven Gasser, you’d think, but the owner of this ’55 Gasser called “Hemi Hunter” gets a big high 5 for doing just that. Of course, it is the warmest day since November 22, it was a balmy 46. Ha ha I’ve got no info except for the pics I took. 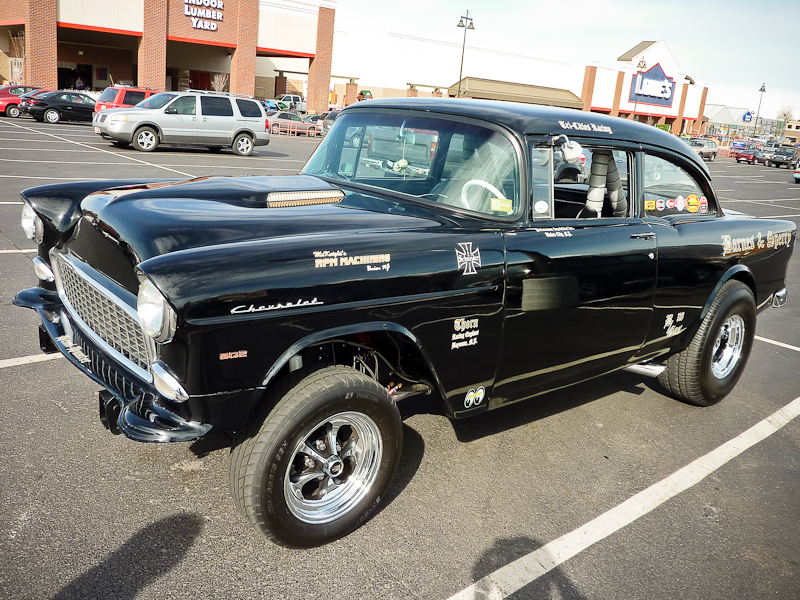 But its a gorgeous example of an early 60’s Gasser built to run on the street. This car was immaculate! 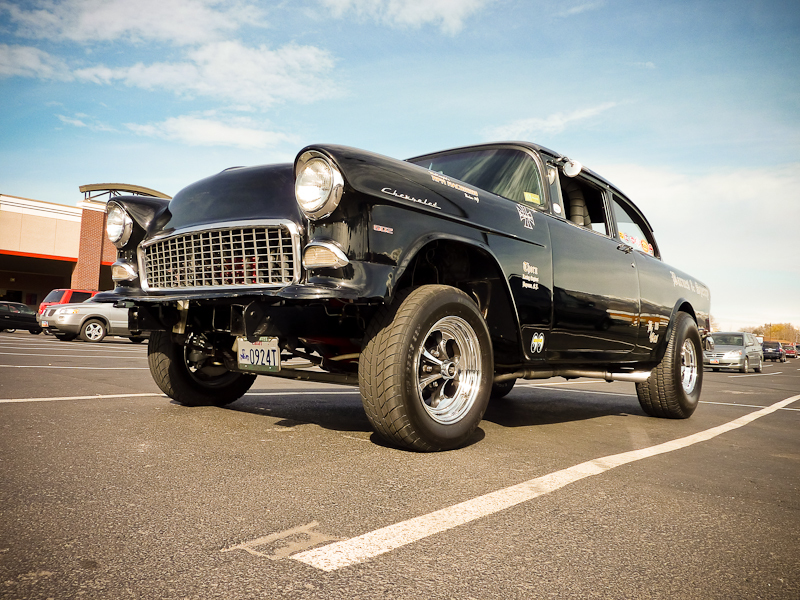 Cherry black paint, all the correct Gasser mods, like radiused rear fender, bumperless, big long tube headers, no front fender wells to block the headers and straight front axle. Those keystone mags set the car off nicely as well. Rad!!! 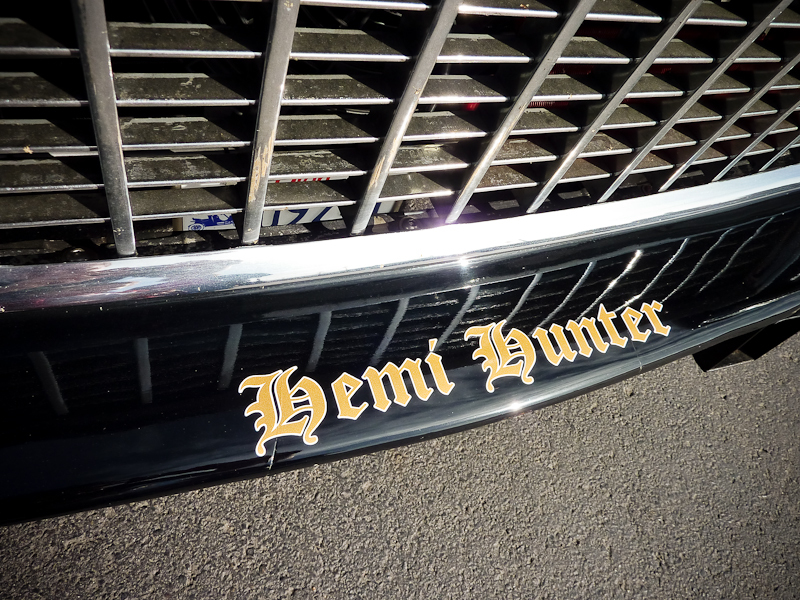 “Hemi Hunter” is right, that’s what a 502ci big block will get ya. Love the gold lettering. Period correct and Rad! Super clean, that’s the word that comes to mind. I dig the scoop sittin’ under the vette hood bulge. That paint is reflecting everything. Wow! Dig that vette hood bulge/scoop and big street meats in the rear! I dig the white steering wheel and white accents. That interior is so clean! There’s that word again, CLEAN. 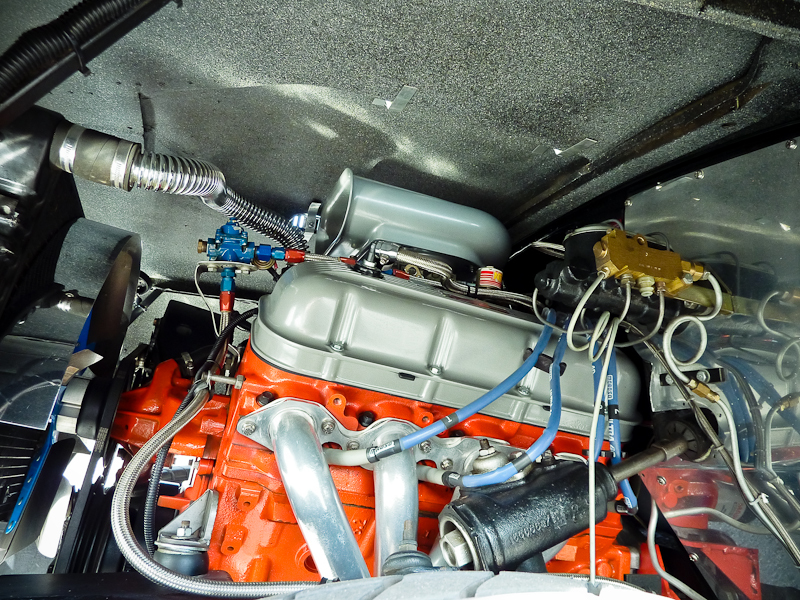 …and one more pic for your hot rod enjoyment. So, all in all, an amazing find for a Saturday morning in February. 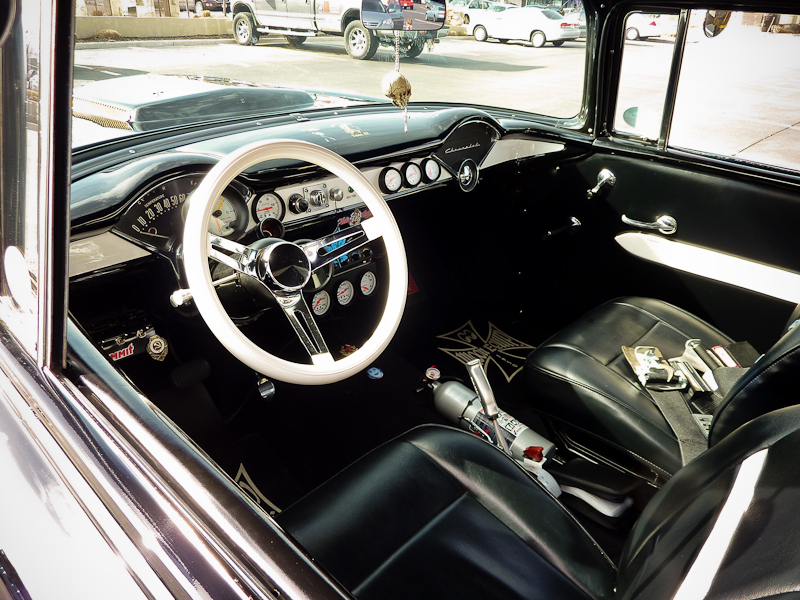 If you own this ride, comment below and help us with the info and history of this car. 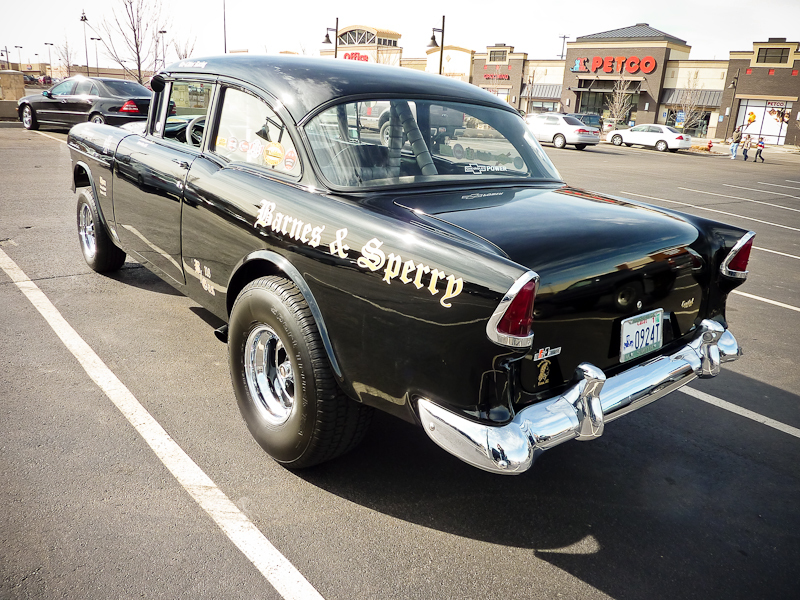 Is that “Barnes and Sperry” name a tribute or is this the same car from back in the day? 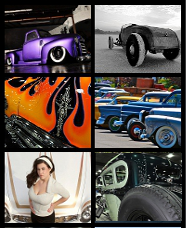 See this link to Gasser Madness website and let me know if you guys think this is the same car? this thing is so cool it makes my teeth hurt! but i doubt its the same car – its too good a copy! those cars never stayed static – they were always evolving. hope it is the original, but i doubt it. too cool either way! That thing is fricken sweet!!! 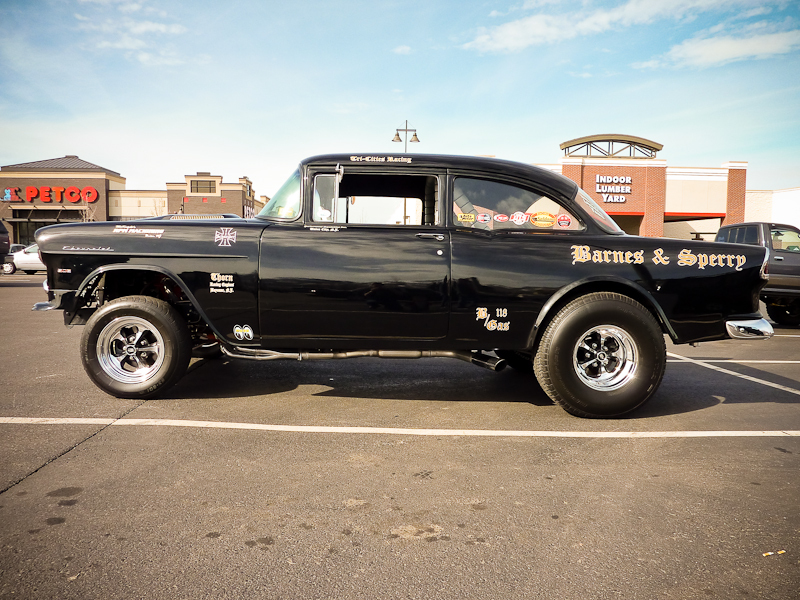 That’s the Barnes and Sperry Gasser, or a replica from Munson Ohio….the Barnes family is my neighbor….wondering if this is the updated version since the Barnes and Sperry 55 has changed ownership a couple times. man thats clean good job thats alot of work. Front axle is dropped, not straight. Straight tube is the one!! i painted that car about 8 years ago. not bad for a back yard paint job. i sold it to one of my buddies and he finished it up with the motor and interior. car has been sold to a couple peole after that tho. This is the original Barnes and Sperry car from Ohio. I bought it off a dentist in Cleveland………..
Hi Al, thanks for your comment. We don’t know the owner and this story was written a while back. Sorry, you might have missed this one! Ok just to clear this up,its not the original Barnes and Sperry, My dad (Art) owned this car in Ohio,painted it and did a lot of work on it(in his small garage),sold it to a buddy of his,(Greg,he was a dentist in Cleveland)and he finished the car, he put that motor and interior in. Then it was sold to a couple of people after that.And if you don’t believe me,I have pictures of that car being built and we are 100% sure that was ours. Thanks Tyler! Always good to know more about the cars we find!